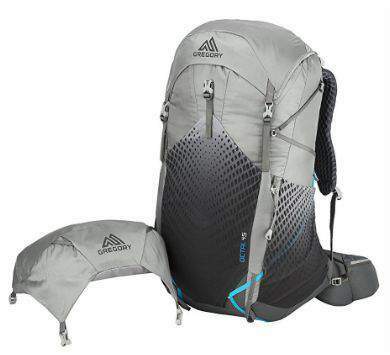 Gregory Octal 45 Pack For Women is an ultralight backpack from a completely new 2018 series launched parallel to the Gregory Optic series for men. Gregory Octal 45 Hiking Pack. Great hip belt and lumbar zone padding. Gregory has launched a brand new series for men and women under the names Optic and Octal, respectively, each with two packs’ sizes. The Optic packs are described in my Optic 48 and Optic 58 reviews. This Octal 45 is the smaller pack from the women’s series which also includes the Octal 55. This is an ultra lightweight series. I know that there exist lighter packs on the market, but typically such low weight is on the account of some essential features. In the case of the Optic and Octal series, very few features are missing, this is what puts them above some other ultra-lightweight packs. This pack has just enough features for all you need, and most importantly its suspension is perfect. The pack is a top loading type, and the lid is removable. This is done on purpose so that you can reduce the weight even more. For such a lidless use, they have included a flapjack which you attach to close the pack. With the flapjack, it looks shorter, see the picture below. The main compartment is with the top access only, and you have a sleeve there for a water bladder. The port for the hose is in the middle and you route it over any shoulder strap. This is the pack with removed lid and with the flapjack instead. When you see the features below, you will realize that these are excellent tools for backpackers. The reason is that they are so lightweight, yet built to carry the load comfortably. You have strong and comfortable suspension which works well for the weight these packs are designed for. This pack is for women, and it is built in three sizes. There is no harness adjustment here, therefore choose your torso size carefully. 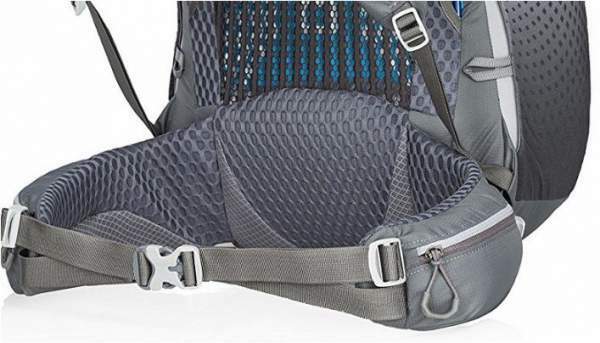 In view of its removable lid and the dual V-shaped compression straps on the sides, this pack can be used even as a daypack. But it is perfect for weekend hiking and backpacking tours. They have what they call Aerospan system here. It is based on a 7001 aluminum frame which runs around the perimeter and ends up in the lumbar zone where it transfers the weight. This is a great design so that you have reduced stress on shoulders. A good pack is supposed to carry the weight mainly on the hip belt; up to 70-80% of the weight should go there so that you can breathe freely. You also have a horizontal bar introduced to prevent barrelling. The frame is rigid but still flexible enough to follow your movement. 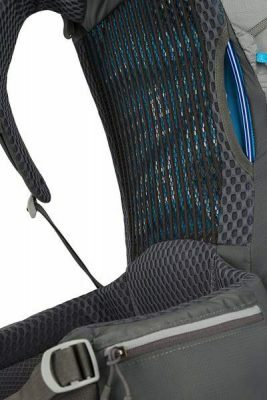 Tensioned mesh on the back separates the pack from the body. There is a tensioned mesh between the body and the pack, so the pack is completely separated for a free air flow. I have several packs of this type, and have been using them for the past 15 years and I know that this is the best way to increase ventilation. But do not listen to those who are telling you that you will not sweat; you will, but this is still the best design. The hip belt and shoulder straps are with a truly great padding covered by a 3D breathable mesh, the padding goes around the edges and there are no seams to create hot spots. They use different padding and mesh in different zones, dependent on the pressure expected in such areas. The lumbar zone is usual for Gregory, and this means massive, see below. So this will give you all support and comfort you need. The adjustable sternum strap is sliding type so you can set it at any position you want. The front hip belt straps are dual from each side, see the picture below. This is again a very nice design because of the hugging effect around your hip bones. You do not have this in the case of a single strap design. The best part of the pack, the lumbar zone and the hip belt. To start from the lid where you have two pockets, one with the access from outside and the other with the zippered entrance underneath the lid. The latter contains the rain cover and the mentioned flapjack. The side mesh pocket and the front large pocket are of the same material and when empty they stick to the pack’s body. But they can take lots of stuff. 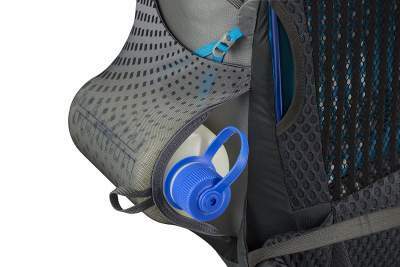 The side pockets are with dual access, from the top and from the side (see the picture below), so that you can easily grab your water bottle. The front pocket is with a buckle which you will use to secure the stuff in it. Dual zippered pockets are available also on the hip belt. So you have 7 pockets in total. Dual access side pockets and inside out compression straps. Rain cover in the underneath the lid pocket. The straps are narrow, built that way to shed the weight, but they are strong and useful. You have it on the bottom for a sleeping pad, and also on the sides. These dual side straps span all the way from the bottom to the top because of their V-shape, so they cover all the area and you can cinch the pack to a very small volume, but you can also fix anything there and carry attached to the pack. 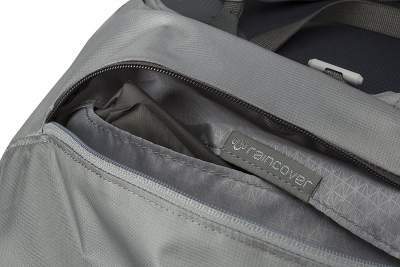 Note that the lower straps are with inside-out feature, so you can use them through the pockets or across the pockets, dependent on the purpose. 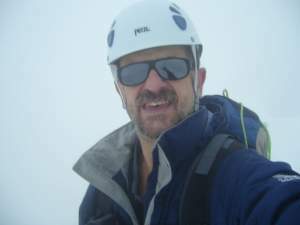 There are trekking poles loops and bungees higher on the front. They also added the QuickStow bungee cord on the left shoulder strap for glasses. The weight can be stripped. – XS: 2.3 lb (1.04 kg). – S: 2.4 lb (1.09 kg). – M: 2.47 lb (1.12 kg). – XS: 2563 in³ (42 l). – S: 2746 in³ (45 l). – M: 2929 in³ (48 l). – XS: 24 x 12.5 x 10 in (61 x 32 x 25 cm). – S: 26 x 12.5 x 10.5 in (66 x 32 x 27 cm). – M: 28 x 12.5 x 11.5 in (71 x 32 x 29 cm). Max carry weight: 30 lb (14 kg). – XS: 14 – 16 in (36 – 41 cm). – S: 16 – 18 in (41 – 46 cm). – M: 18 – 20 in (46 – 51 cm). They suggest the following: if you are a very slim person, it is best to size down; if you are a big person, size up. You can see more about the Osprey’s packs in my texts about Eja 38 and Eja 58. The Eja packs are great but the hip belt design in the Octal packs is better. The same holds for the packs for men, the Gregory Optic packs and new Exos 2018. In my view, this time Gregory is better; see more in my separate text. In the conclusion of this Gregory Octal 45 Pack For Women review, I would like to stress again that I am impressed with this pack. It is designed with weight shedding in mind but it remains great where it matters most and this is the suspension. So you have the hip belt and the lumbar zone designed in the way you would expect to see in heavier Gregory’s packs like those from the Maven series. Even the rain cover is there, and this adds value to this pack. I can fully recommend this pack for shorter hiking and backpacking tours. Do not miss to check its bigger cousin the Octal 55 pack.